An eventful renewal of the Gigginstown House Midlands National Handicap Chase at Kilbeggan saw Golden Kite hanging on for victory. One of three horses battling it out approaching the last when Classic Frontier's departure of pushed him to the lead. Trained by Adrian Magire, the eight year old pushed himself to the limit for under Brian O'Connell, as held off the challenging Decoy Daddy to get past the post a length and a half in front. Away We Go went away at the first, while the front-runner Mr Bishop, still going well for Andrew Lynch, faded off three out. 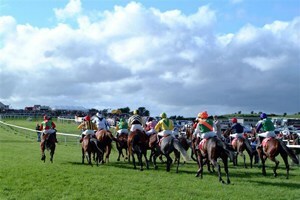 Maguire, whose charge placed second on his previous show at Listowel, said, "Brian gave him a great ride. "This horse has been a great servant from day one, he's an easy horse to train. It's a great success. "Things have been quiet during the summer and it's nice to get a big one. He has an entry in the Galway Plate, but today was the day and we'll see how he comes out of this."